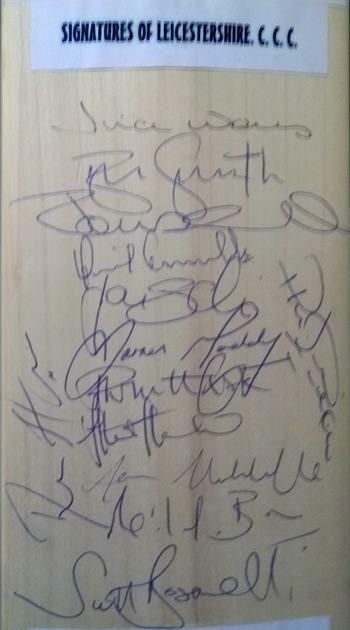 Printed autographs of the South Africa tour party on a Gradidge mini cricket bat. 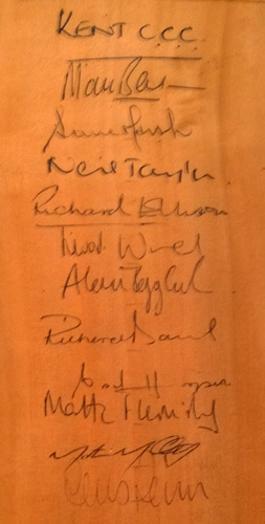 Reverse of bat hand-signed by players from the Middlesex and Lancashire teams who played the tourists in 1935. N.B. 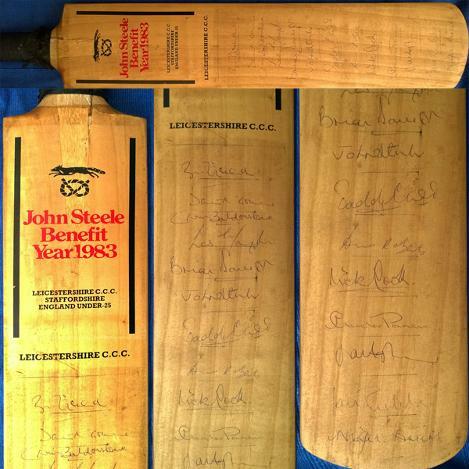 The images of the reverse of the bat have been enhanced as the autographs have faded. Middlesex team: WFF Price, GE Hart, JW Hearne, EH Hendren, JH Human, GC Newman, RWV Robins, HGO Owen-Smith, JHA Hulme, CIJ Smith & IAR Peebles. Lancashire team: FB Watson, JL Hopwood, J Iddon, E Paynter, C Washbrook, W Farrimond, WHL Lister, PT Eckersley, FM Sibbles, G Duckworth & R Pollard. South Africa won this series 1–0 with the four matches drawn. A victory at Lord's was their first win in a Test match in England ... This also meant that the tourists won a series for the first time in England. ENGLAND: Ted Dexter, Colin Cowdrey, Fred Trueman, Brian Close, Ken Barrington, Micky Stewart, Derek Shackleton, Fred Titmus, Peter Richardson, Jim Parks, Tony Lock, Jim Laker & David Larter. WEST INDIES: Frank Worrell, Conrad Hunte, Alf Valentine, Gary Sobers, Seymour Nurse, David Allan, Tony White, Willie Rodriguez, Basil Butcher, Charlie Griffith, Wes Hall, Rohan Kanhai, Easton McMorris, Joe Solomon, Deryck Murray, Lester King + Berkeley Gaskin (tour manager). 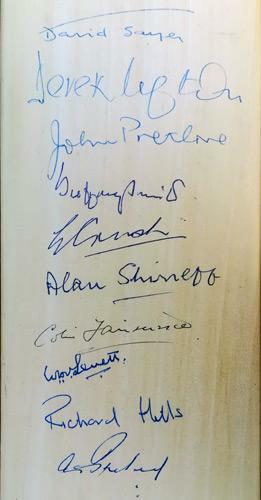 Also signed by Gloucestershire players inc: Tony Brown, David Shepherd, David Graveney, Alastair Hignell & Zaheer Abbas. 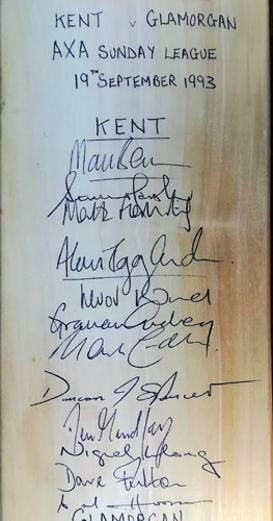 Also signed by Essex, Sussex & Hampshire players: inc Mike Denness (former Kent captain), Keith Fletcher, Ray East, Ken McEwan, Trevor Jesty, Andy Roberts & John Barclay. 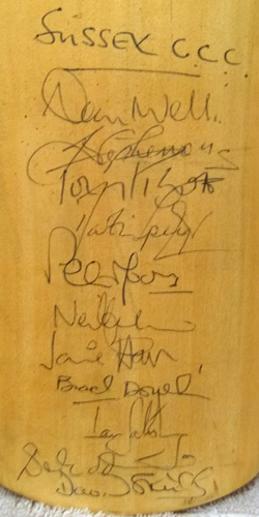 Squad signed full-size cricket bat for his 1983 Testimonial Season. 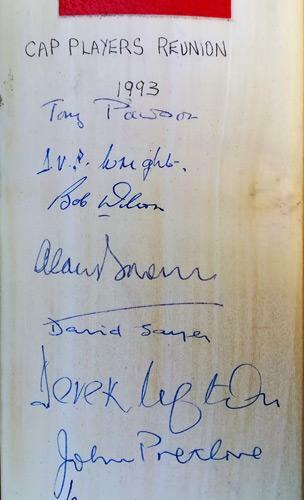 Andy Roberts, David Gower, Jonathan Agnew, Les Taylor, Chris Balderstone, Roger Tolchard, Brian Davison, Nick Cook, Nigel Briers, Graham Parsons, John Steele + 2 others. £80 inc P&P / UK only delivery. inc: Wells, Pigott, Moore, Salisbury, Lenham & Speight. 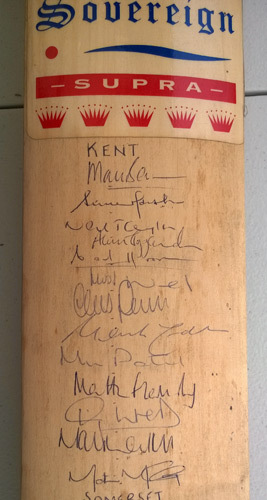 Kent players include: Mark Benson, Steve Marsh, Matthew Fleming, Alan Igglesden, Trevor Ward, Graham Cowdrey, Mark Ealham, Darren Spencer, Dean Headley, Nigel Llong, Dave Fulton & Carl Hooper. Glamorgan players inc: Viv Richards (see below), Robert Croft, Matthew Maynard, Steve James, Steve Watkins, Alan Dale, Hugh Morris, Colin Metson, Roland Lefebvre, Steven Barwick,Tony Cottey * 2 others. The 1993 AXA Equity & Law Sunday League season came down to a nail-biting finish with Kent & Glamorgan tied on points going into the final (televised) match in Canterbury. Glamorgan (201-4) beat Kent (200-9) by six wickets to win the league. This match was West Indies legend Viv Richards' final one day appearance and his last game for his adopted Welsh county. Fittingly the "Master Blaster" was at the crease (46*) when the winning runs were scored. This win was also saw Glamorgan lift their first-ever one-day trophy. 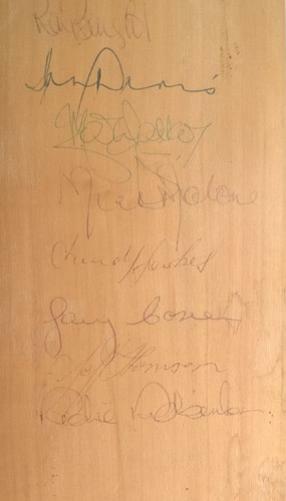 14 former players autographs include: Tony Pawson, Doug Wright, Bob Wilson, Alan Brown, David Sayer, Derek Ufton, John Pretlove, Godfrey Evans, Ed Crush, Alan Shirreff, Colin Fairservice (1929-33), Hopper Levett, Richard Hills & one other. 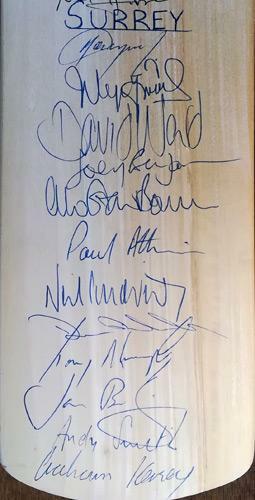 Paul Prichard (captain), Nasser Hussain, Ronnie Irani, Peter Such, Stuart Law, Mark Ilott, Darren Robinson, Robert Rollins, Neil Williams, Danny Law, Ashley Cowans, Paul Grayson & Darren Cousins. 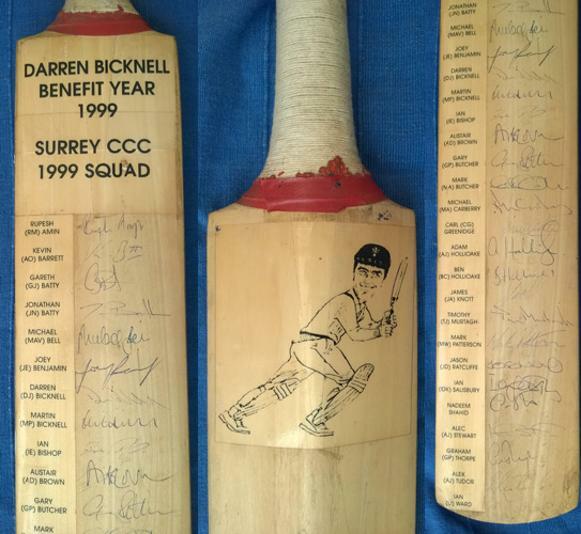 Squad signed full-size cricket bat with printed caricature (on reverse) to commemorate Bicknell's 1999 Benefit Season. Darren & Martin Bicknell, Adam & Ben Hollioake, Jonathan Batty, Gareth Batty, Joey Benjamin, Ian Bishop, Alec Stewart, Graham Thorpe, Ian Ward, Ian Salisbury, Alistair Brown, Alex Tudor, Gary Butcher, Mark Butcher, Michael Carberry, Carl Greenidge, Nadeem Shahid + 6 others. 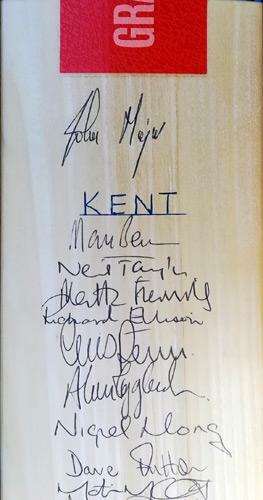 Kent v Surrey Squad signed Gray Nicolls full-size cricket bat. 12 Kent players include: Mark Benson, Neil Taylor, Matthew Fleming, Richard Ellison, Chris Penn, Alan Igglesden, Nigel Llong, Dave Fulton, Martin McCague, Min Patel, Dave Fulton & Carl Hooper. 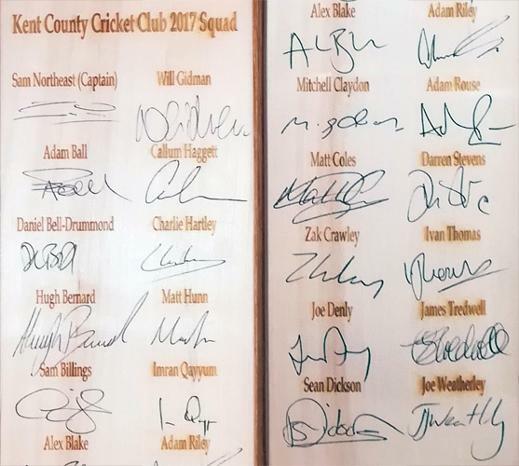 12 Surrey players include: Alistair Brown, Joey Benjamin, David Ward, Ian Bishop, Andy Smith, Graham Kersey & others. 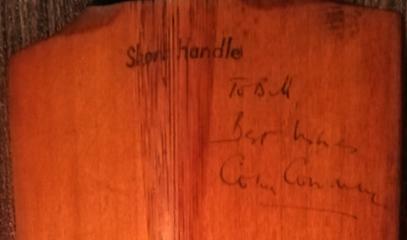 Also signed by former Prime Minister John Major (Surrey's President in 2000). 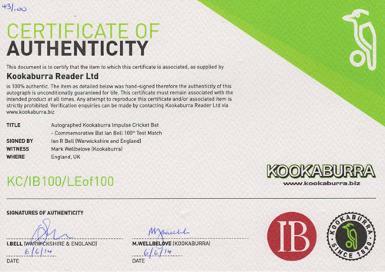 Signed Limited Edition (43 of 100) specially produced Kookaburra Impulse full-size cricket bat to celebrate his 100th cap for England. 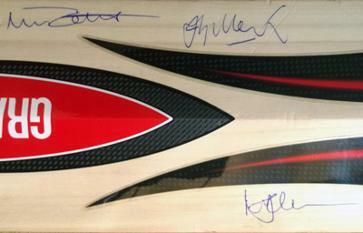 Comes with COA signed by Bell and Kookaburra's Mark Wellbelove. 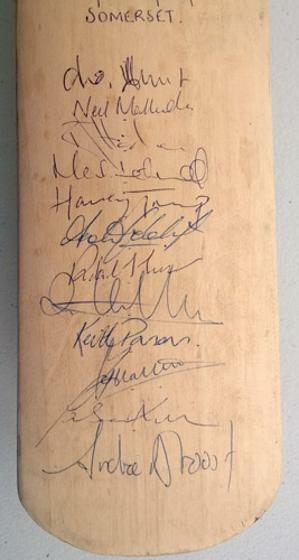 1988 Touring Team to England Gray Nicolls mini bat with printed autographs of the squad inc: Viv Richards (Capt), Malcolm Marshall, Curtley Ambrose, Courtney Walsh, Ian Bishop, Desmond Haynes, Gus Logie, Roger Harper, Carl Hooper, Keith Arthurton, Winston Benjamin, Patrick Patterson, etc. Darren Maddy, Iain Sutcliffe, Vince Wells, Ben Smith, Aftab Habib, Darren Stevens, Chris Lewis, Phil DeFreitas, Neil Burns, Anil Kumble & James Ormond. 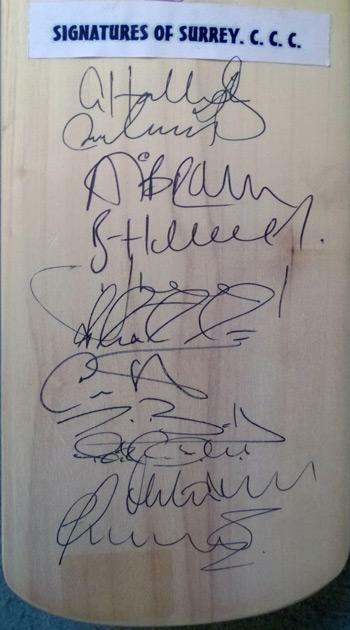 Bat signed by 11 Surrey Lions players, inc: Mark Butcher, Ian Ward, Nadeem Shahid, Adam Hollioake, Alistair Brown, Ben Hollioake, James Batty, Martin Bicknell, Alex Tudor. Ian Salisbury & Saqlain Mushtaq. Celebrating the county's three County Championship Titles in four years: 1999, 2000 & 2002. 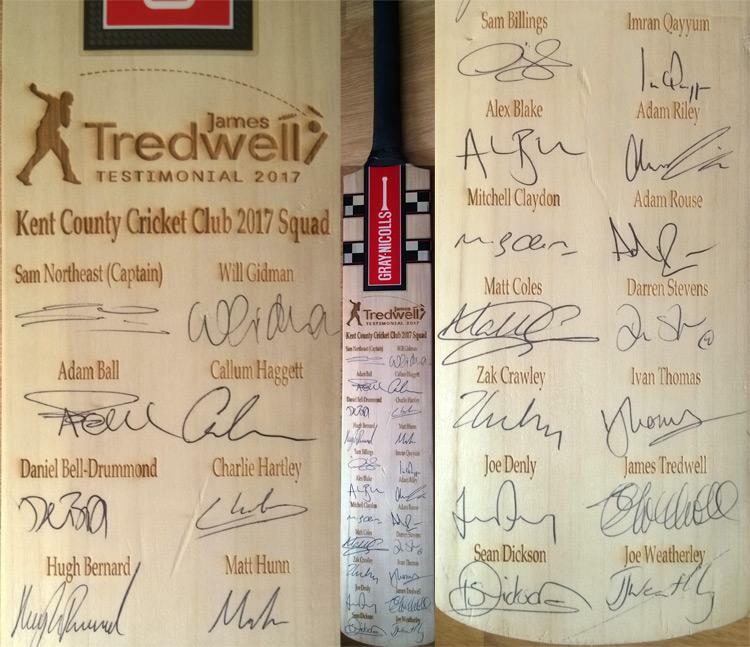 Bat signed by 15 players inc: Adam Hollioake (captain), Saqlain Mushtaq, Alec Stewart, Mark Ramprakash, Alec Tudor, Graham Thorpe, Mark Butcher, Ian Salisbury, Alistair Brown, Tim Murtagh, Rikki Clarke, Ian Ward + 3 others. + on reverse by KCCC Coaching Staff: Matt Walker (Head Coach), Jason Gillespie & Min Patel.